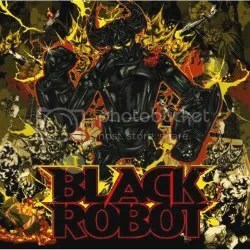 Black Robot (a great band name if there was one!) is good ol’ rock ‘n’ roll influenced by acts like Led Zeppelin, AC/DC, Black Crowes and the Rolling Stones and even though the band doesn’t list them as an influence, I even hear a bit of Stone Temple Pilots. Much like The Last Vegas and Charm City Devils, there’s a cool retro vibe going for this band as they display a raw garage rock ‘n’ roll style that borrows from the 1970s and southern rock. Oh, and one other band you might be able to draw a comparison to is Buckcherry. Which isn’t surprising because Jonathan Brightman (who, along with Huck Johns, is the driving force behind Black Robot), Yogi Lonich and Devon Glenn all were members of that band up until it dissolved in 2002. Lonich and Glenn have since left Black Robot but gGuitarists Andy Andersson & Staffan Osterlind have stepped in, as has drummer Possum Hill. To my understanding, this album was actually released in 2009 but the band went back into the studio with guitarist Andy Andersson (Osterlind hadn’t yet joined) and recorded two new tracks for this 2010 re-release. Knowing the Buckcherry connection, I was immediately interested in hearing this band but somehow, despite the best of intentions, I ended up losing track of when the album was coming out. Luckily, the Gods of Rock had pity on me and the day after I had remembered to check them out, a review copy wound up in my mailbox! Talk about destiny! “Baddass”, the album’s opener, sees the album off to a running start. It’s a great way to introduce people to the band. Loud rock ‘n’ roll where the singer sings about how bad he is? Who could not love it? Next up is what sounds like AC/DC doing a cover of “Cocaine” (made famous by Eric Clapton, originally performed by J.J. Cale). Then there’s the jangly “Momma Don’t Cry” which I hear parts of STP and parts of Jimi Hendrix. My absolute favorite track is the raucous “Girls Kissing Girls” (which has always been a favorite subject of mine) that sees the band back in AC/DC mode. The ballad “I’m In Love” is another album highlight bringing to mind ’70s southern rock and STP again. I think singer Huck Johns is a great voice throughout the whole album. He seems to easily capture Bon Scott and Scott Weiland, depending on what the song calls for. Anyone who is a fan of the bands I have mentioned will enjoy this album. There are many great rock bands out there today, but there’s not many with as classic of a sound as Black Robot, so support real rock ‘n’ roll!